Adding sweetness to the holiday season for year-end celebrations, Del Monte, one of the leading food and beverage brand in India, has come up with a social media campaign for all the sweet enthusiasts’ called #SweetEscapades. The campaign inspires home chefs, home and professional bakers and the likes to create delectable desserts made effortlessly using exotic packaged ingredients by Del Monte. Understanding the customers’ desire of creating new recipes without spending too much time, Del Monte’s Sweet Escapades campaign thrives on recipes that are quick and easy to prepare, and use those ingredients that are common to one’s household kitchen, along with Del Monte’s packaged and dried fruits. For this, Del Monte has taken up a unique format of videos which are short, informative and captivating. The campaign also highlights and promotes the resourcefulness and usage of Del Monte’s packaged fruits which are used in the short recipe videos. It focuses on enabling the consumers to experiment their own recipes incorporating Del Monte dried and canned fruits. Del Monte offers a diverse range of packaged fruits such as Pineapple slices, Pineapple Tidbits, Peach Halves, Fruit Cocktail, Dried cranberries & Prunes. The Sweet Escapades Social Media campaign has reached over 5 million people with 98% of audience being women and interested in making desserts at home. As part of the campaign, Del Monte is also inspiring home bakers to take part in a dessert making contest in association with ‘Home Bakers Guild’, a popular baking community with over 1.2L members. Inspired by the common love for baking, ‘Home Bakers Guild opens the platform for likeminded home and professional chefs. Del Monte Sweet Escapades contest has invited entries from the members of the group to share their unique recipes created with the help of Del Monte ingredients. Top 10 entries will be chosen by a special jury and the winners will be rewarded with goodies from Del Monte worth nearly 60k. The contest will conclude on 30th December 2016. Brand Del Monte has over 100 years of rich international heritage during which it has been synonymous with quality and taste. The brand originated in the US and is now available all across the globe. The Del Monte range of branded processed food and beverage products in India includes Fruit drinks, Ketchup & Sauces, Packaged Fruits and the Italian Range consisting of Pasta, Olive Oil and Olives/Jalapenos and a Culinary range for both B2B and B2C markets. 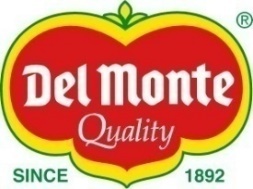 Del Monte was brought to India in 2007 by a joint venture between Bharti Enterprises and Del Monte Pacific Ltd. The JV is called FieldFresh Foods Pvt Ltd.
India’s leading business group, Bharti Enterprises, has interests in telecom, agri-business, and retail. With over 228 million customers, Bharti’s flagship unit, Airtel Ltd., is India’s leading private sector provider of telecommunication services. Del Monte Pacific Limited is listed in the Singapore Stock Exchange and has exclusive rights to the Del Monte brand for processed food and beverage products in the Indian subcontinent and in the Philippines where it enjoys leading market shares for canned pineapple juice and juice drinks, canned pineapple and tropical mixed fruits, tomato sauce, spaghetti sauce and tomato ketchup.